Finding the cheapest car hire in Malaga can be tricky. 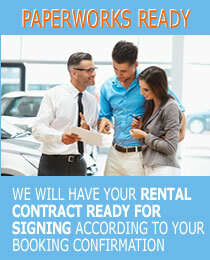 We cannot stress enough how important is that you are up to date with the tendencies within car rentals in Malaga. The phenomenon of car hire companies in Malaga that offer socalled cheap car hire Malaga, but yet are selling all sorts off add ons, insurances, fuel and the like on arrivel, has been ongoing for years. This page is aimed at shedding some light on some of the "classic" marketing tricks and some of the latest strategies you should watch out for before booking your cheap car hire malaga. When doing a price comparison for car rentals Malaga airport, you should be aware of the fact that many companies charge about 30€ MORE for the full tank of fuel than the current market price per litre at any petrol station in Spain. For obvious reasons this is normally NOT clearly advertised in advance! Apart from the high price per litre, these companies make another 15-20€ on average per rental, i.e. the 15-20 litres of fuel left in the tank when the car is to be returned "as empty as possible" and with no refunds for unused fuel. 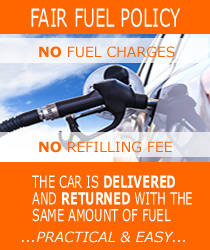 This is all done deliberately and is part of the mutual agreement between the booking website and the car rental supplier in Malaga and their pricing policy, allowing the latter to earn their "cut" on the fuel. Please keep in mind that companies operating in this way towards their customers will NOT be friendly or service minded to deal with regarding any economic aspect such as damages, charges, payments refunds and so on. bMetCarhire offer you what we think is the currently best deal on CAR RENTAL MALAGA ALL INCLUSIVE. Be aware that many companies offering CAR RENTALS MALAGA ALL INCLUSIVE ask for som e sort of credit card "DEPOSIT" as an excuse for selling you additional insurances to a high price. 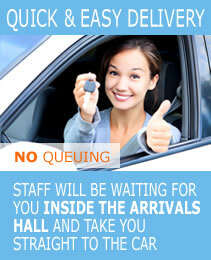 When comparing rates you will find that our rates possibly are the cheapest car rentals in Malaga today. The car hire rates offered are all fully comprehensive car hire Malaga without excess and without additional costs. We offer car rental malaga with the cars are on-site Malaga airport - the car will be ready for delivery when you arrive. With cars on site at Malaga airport you will be able to drive off towards your holiday destination short after the arrival. 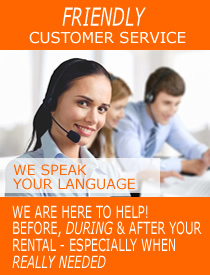 Car rental Malaga cars on-site is quick and easy ...and everything is included in THE QUOTED PRICE!